The unfolding story of the rise of Western classical music in Korea and China is in its early chapters as yet, but on tonight's evidence, it is turning out to be a thriller. Myung-Whun Chung and the Seoul Philharmonic presented an incandescent Pathetique to cap a first half by turns sumptuous and dazzling. It is a bit of a puzzle why a performance this good was not more ardently foretold. For instance, their current European tour takes them to Amsterdam, Gragenegg and Bremen as well as Edinburgh, and one wonders how the BBC missed out on programming them for the Proms. Gramophone Magazine's recent blog post about the SPO's recent exclusive contract with Deutsche Grammophon is remarkable for the snippy comments. How do people become well informed, though, except through the live experience? It makes for an interesting equation, quality in relation to reputation. Without doubt, the SPO has the former in abundance, and it can only be a matter of time before the latter catches up. It makes for an interesting comparison, too, with our local symphony orchestra, the RSNO. While the SPO was founded just after the second world war, the decision to invest in the development of an international class outfit is altogether more recent, 2005—roughly when Denève took up his post in Glasgow. In both cases, the dedication and hard work has paid off handsomely, and accordingly the two show a similarly rising standard of visiting guest artists. The comparison has to end somewhere, though: that DG contract tells its own story. Immediately, the choice of the youthful Messiaen's Offrandes Oubliées announced a lavishly polished string tone that perfectly complemented the score's mystic intensity. If the colouration contributed by the winds and percussion does not yet have the mature Messiaen's assured imagination, the palette is plenty rich enough, and one can savour a certain radicalism in his using the rational modernist language to express a deeply-felt piety. 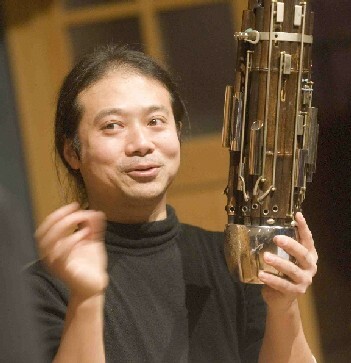 The concert's centrepiece was a concerto for the traditional Chinese instrument, the sheng, by Unsuk Chin. What is it, and what is it like? It is a form of mouth organ, comprising a set of pipes mounted vertically and resembling a tightly contained miniature pipe organ. Its timbre resembles in some respects a western mouth organ, in others, especially in its capacity for polyphony, again the idea of a scaled-down pipe organ's 4' or 2' register give some sort of approximation. Again, modern instruments are keyed to afford full chromaticism, and in that respect one might think of some innovations in Borders and Northumbrian small-pipe craft. Of course this description says nothing about the dimension contributed by the brilliant virtuosity of soloist Wu Wei, complemented (and complimented) by Unsuk Chin's spectacular score. More than a mastery of colour and texture, and a deft facility for manipulating pulse that isn't always apparent among her peers, this work showcases a tremendous sonic imagination. If one were to reach for comparisons, it might lie in similar territory to Tan Dun and Kaija Saariaho; certainly Šu made as strong an impression as the latter's recently-performed Orion. It seems a long time since avant garde composers ventured inside the piano, for instance, but there Chin found some wonderful gong-like sonorities. Wu Wei, in front of a scintillating orchestral performance, demonstrated an elemental dynamism, contorting his body vigorously as he conjured his array of densly eloquent timbres. For all the virtuosity, though, perhaps the most haunting passage was the simplest, the closing measures being wrought of the finest delicate, elusive timbres of the entire work. The reassuring familiarity of the Tchaikovsky symphony that followed afforded a change of perspective, and one could focus on the qualities of the orchestra as Myung-Whun Chung's lush, impassioned reading unfolded. The immaculate coordination, the disciplined intonation, and the wonderfully balanced ensemble actually — can you believe it? — prompted the thought: is this too perfect? The resounding 'no', though, was to be found not so much in the music as among the musicians, who were demonstratively and expressively engaged not only in their own individual performances but in rapport with each other. It was a joy to behold. Between movements, applause broke out. Quite substantial after the first movement; a trickle after the second; and a veritable ovation after the third, which caused Chung to turn and, one thought, almost take a bow — but no, to give a bemused smile. The finale being somewhat down in mood, he and the orchestra let us have a couple of encores, Rakhmaninov's Vocalise, and a fierce Brahms' first Hungarian Dance.